Here is my first project, when it was nearing completion. 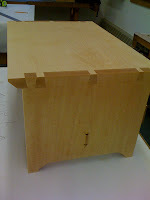 It is a maple step-stool with dovetail joinery between the top and sides, and mortise and tenon joinery for the stretcher. 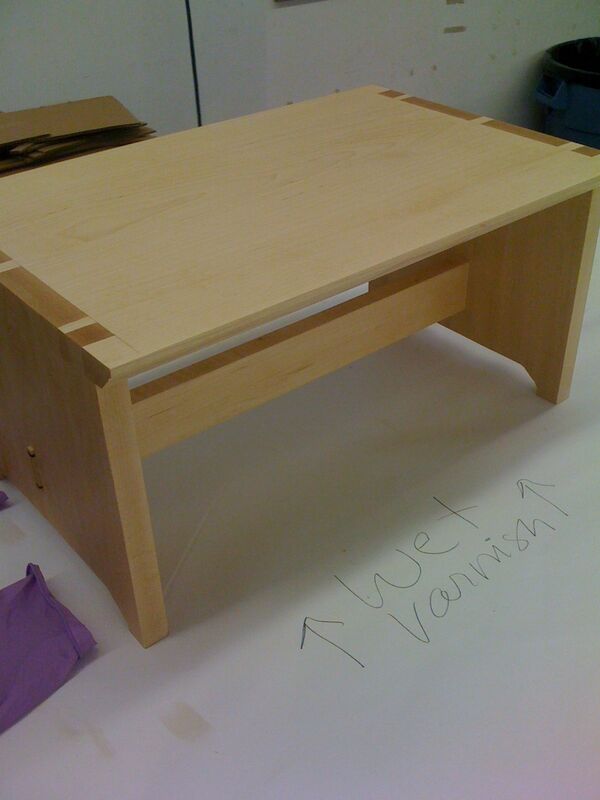 We have moved on to our case piece project. Mine is a small wall-hanging cabinet with a 2 drawers, 3 shelves and a door, incorporating both slab and frame & panel construction. It is quite modest but I want to be able to learn everything thoroughly (and finish it!) Maybe I'll be a wall-hanging cabinet and step-stool maker. I'll get really good at making 2 things, ...kinda like my cookies and granola. I'll be a granola/cookie/wall-hanging cabinet/step-stool maker. The rest of my class all seem to have taken on bigger and more complicated projects (but then everyone has more experience than me). Sometimes I dream that I have a more complicated piece, like one with legs. I do want to learn how to make legs. And yes, I even dream woodworking.